Contributed by: Thulsa ( ), partly based on source material from "GURPS Conan" by Steve Jackson Games. "Men say our cult is a survival of the ancient Stygian serpent worship. That is a lie. Our ancestors came from Vendhya, beyond the Sea of Vilayet and the blue Himelian mountains. We are sons of the East, not the South, and we have knowledge of all the wizards of the East, who are greater than the wizards of the West." 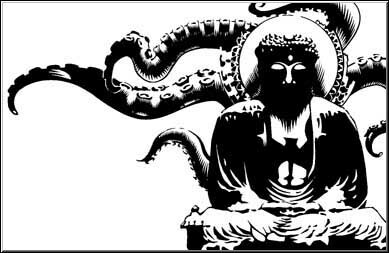 -- Robert E. Howard: "Hour of the Dragon"
Most Vendhyans worship Asura, who teaches that life is illusory and the only final truth comes after death, in the light of the soul. The cult devotes itself to "penetrating the veil of illusion of life". Asura’s doctrines reveal that all beings reincarnate, and that the purpose of life is the paying of the karmic debt against the soul. Each evil act extends the cycle of reincarnation; each good act shortens it. Those who suffer earned their trials in previous lives; they are not to be pitied. According to his priests, Asura has no true form, but is a part of all cosmos. When the god wishes to send messages to his followers, he does so by the reincarnation-birth of an exceptional mortal. Some priests of Asura wander the land as beggar-priests, while others are members of the upper caste of Vendhyan society, the Brahma, who are scholars and rulers. All participate in rituals of meditation and purification, including ritual baths in the holy rivers of Vendhya. The priests command the lowest caste, the Untouchables, during cremation ceremonies, where the dead are burned to dust on great funereal pyres, their ashes blessed and spread on the winds. Anyone not properly cremated may rise as undead.